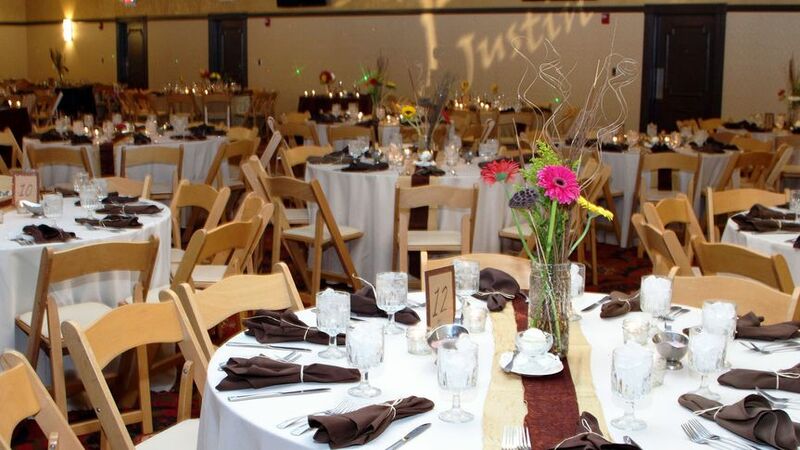 Spazio Westport is an award-winning wedding venue located in Saint Louis, Missouri. 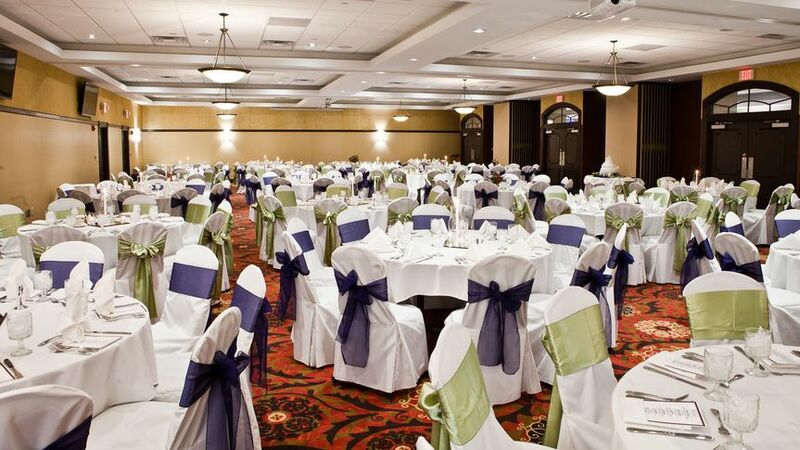 With unique banquet rooms, a contemporary atmosphere, and delectable cuisine options over 50 years in the making from Russo’s Catering, this venue is dedicated to making your special day utterly unforgettable. 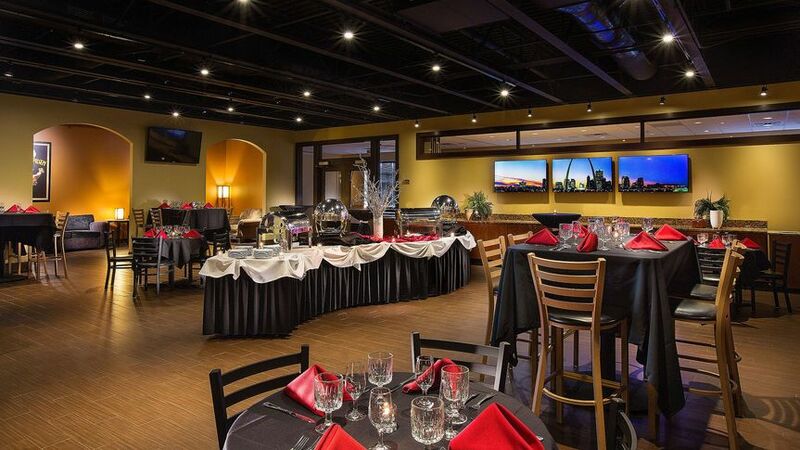 Spazio Westport offers three spacious banquet rooms for wedding events. The Spazio Ballroom is more traditional, featuring intricately designed carpeting, crown molding, vaulted recessed ceilings, and sleek chandeliers. Couples can host up to 300 guests in this space. The two-tiered Garden Room can comfortably seat up to 150 guests and is accented with stone elements, stained glass windows, brick pillars, natural lighting, and French doors. The Garden Room is also surrounded by an outdoor covered patio, allowing for indoor and outdoor space. Best suited for dinners of up to 100 guests, The Bistro offers an intimate, family-style appeal with LED televisions, an earth-toned tile backsplash, hardwood floors, and an open ceiling concept. The Bistro can also be used for your cocktail hour, and can accommodate up to 150 guests standing. A specialist can be assigned to you to help in the planning of your wedding. Your wedding package always includes the use of tables, chairs, flatware, glassware, china, and linens, and the cost of any setup and cleanup services. 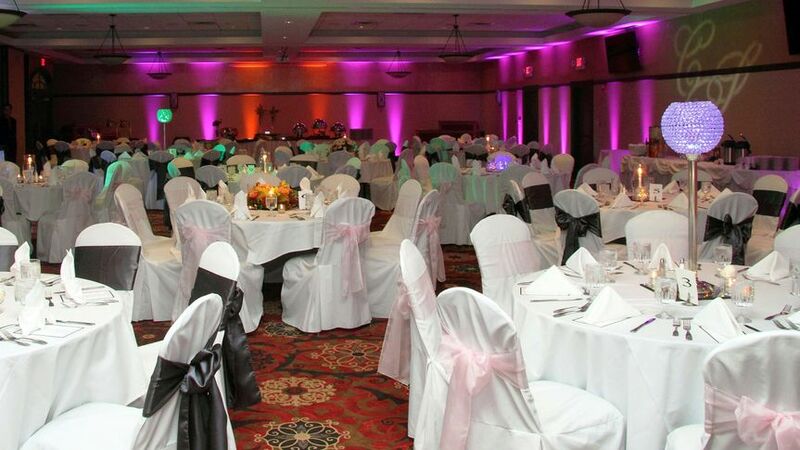 Depending on your needs, various lighting and audio equipment can be added to your package, and centerpieces, decor, and a dance floor can be provided. All wedding event spaces are wheelchair accessible. 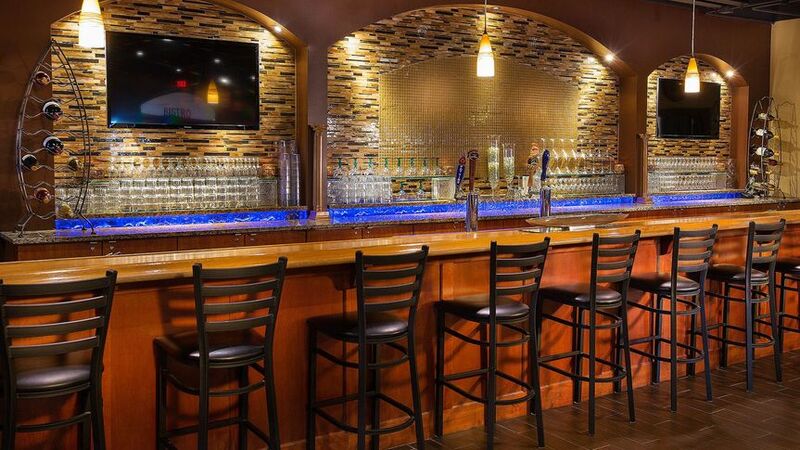 Spazio Westport also features ample parking and a connecting hotel for your out-of-town guests. 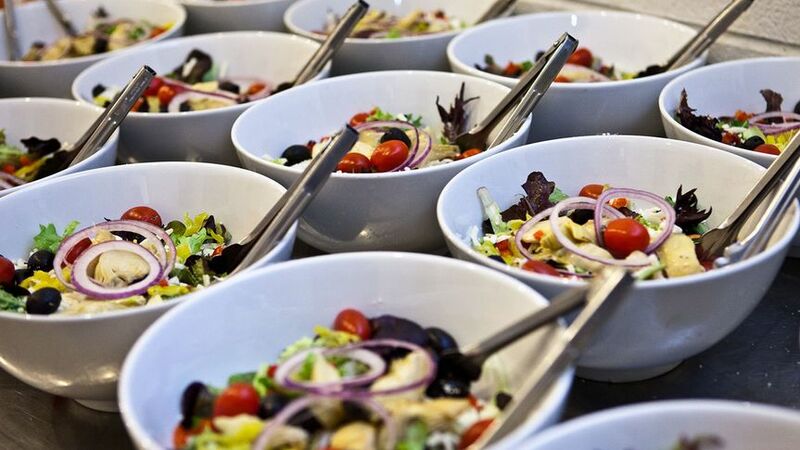 Russo’s Catering is happy to work with you to create a custom wedding menu that suits your preferences, diet, and needs. 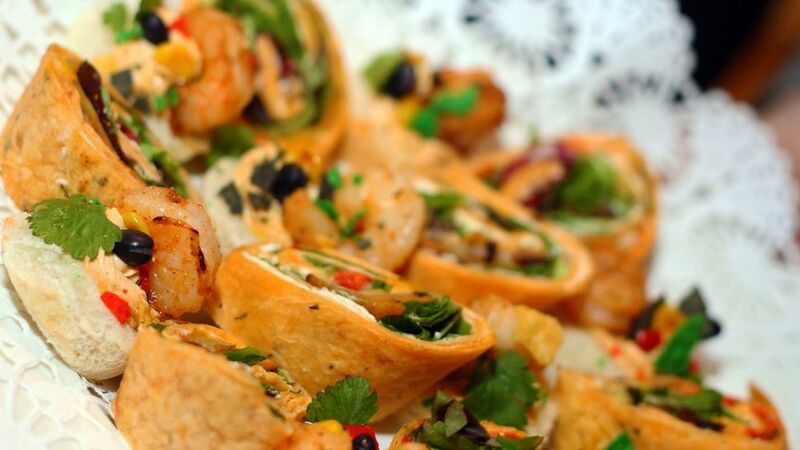 Couples may choose from buffet, family-style, and plated serving style options. Hors d'oeuvres and passed appetizers can be served during your cocktail hour. You can choose from a variety of flexible open bar packages, with service generally lasting up to four hours. A wedding cake decorated by Russo’s pastry chef and cake cutting service can be provided. An extensive collection of cake flavors, icings, and fillings are available for you to taste and combine as you like. Amazing food. Gorgeous venue. Fantastic professional staff. I had an amazing experience at Spazio. Brenna was wonderful to work with and she made the planning process painless. With Spazio’s “all inclusive” wedding plans I was able to cut my vendors in half. Every one of my guests loved the venue and had an awesome time. 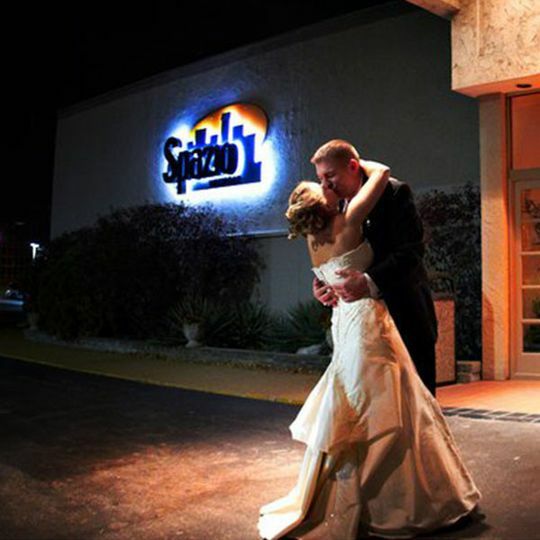 My wedding day is a day we will always remember and I am so glad we chose Spazio as our venue. I was driving myself crazy trying to find a place for our reception that could hold around 250 people and wouldn't cost my first born child until I found Spazio's. I can't say enough good things about our experience working with Emily and Russo's in general. They were quick to respond with questions, had amazing food and were willing to do just about anything to make our day go off without a hitch. We also happened to have an insane number of dietary restrictions amongst our guest list and they accommodated all of them (vegan, vegetarian, gluten-free, peanut free). Our guests all had a great time, but more importantly, my new husband and I had an amazing time. Plus, there are tons of hotel options right in the area, so it's easy for guests to get to a place to crash quickly. We can't say enough good things about Emily and the staff at Spazio's...seriously incredible.